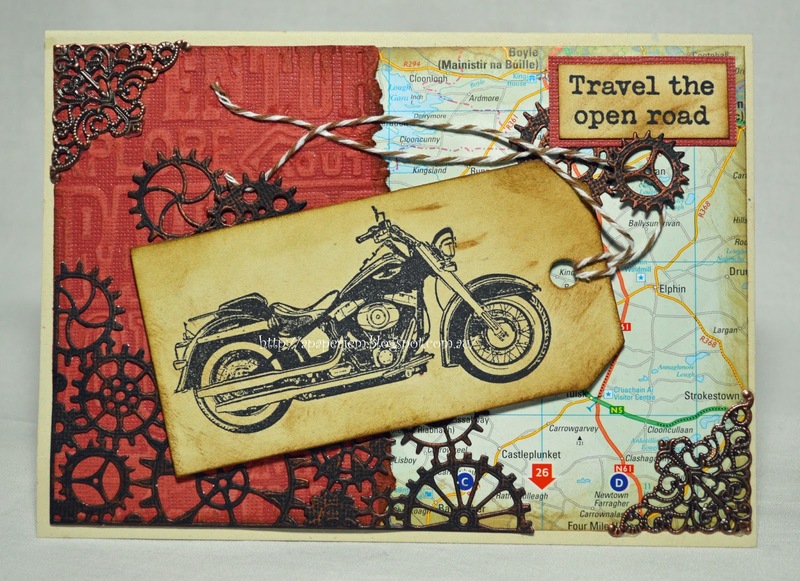 My card today features stamps from Darkroom Door's Classic Motorcycles Collection . There are five bikes and captions in the set so heaps to choose from! I started by die cutting a tag and then inking it with Brushed Corduroy Distress Ink. I stamped the image using black Archival Ink and then added some twine to the tag. The background used an Alterations embossing folder. I used core card so that I could sand it back and have some colour variation. The other side is page out of a map book. Antique Gear Set. Bec is able to order these in for you from the store link here. They have had gilding wax rubbed over them to make them look metallic. Don't forget you can make your own paper creation and add it to Bizzy Bec's April Challenge by clicking the link here- you could win a mystery die! Cool card! Love the gears on the background! Thanks for joining us at Die Cuttin Divas this week! What a great card! Thanks for joining us at Die Cuttin' Divas this week. What a fabulous card!!! Thanks for joining us at DCD this week!